Found 3 file extension associations related to XVL Studio PRO and 3 file formats developed specifically for use with XVL Studio PRO. XVL Studio Pro is a high-end application dedicated to rapid exploration and validation of designs, scalable to very large data sets. The application offers such advanced functions as automated interference and clearance checking of complex assemblies and display of results in a spreadsheet format, integrated 2D/3D cross-sectional views including profile display of interfering parts, and all the capabilities of XVL Studio Basic and XVL Studio Standard. This application is ideal for design review by digital mock-up and otherwise exploring digital models across the extended enterprise by non-CAD trained personnel. Full featured viewing: Zoom, pan, rotate, measurement, annotation, texture mapping. Assemble parts from multiple CAD systems or files after conversion to XVL of direct import of IGES and Polygon formats. Animation Definition: Define full anima-tion, and assembly/disassembly animations with multiple camera views, keyframe editing, and automated/semi-automated process animation. Assembly Structure Edit: Display and edit assembly structures and process; flexible re- naming, regrouping, or editing of properties. Advanced viewing with multiple windows and snapshots. Snap In Assembly of parts or sub-assemblies. 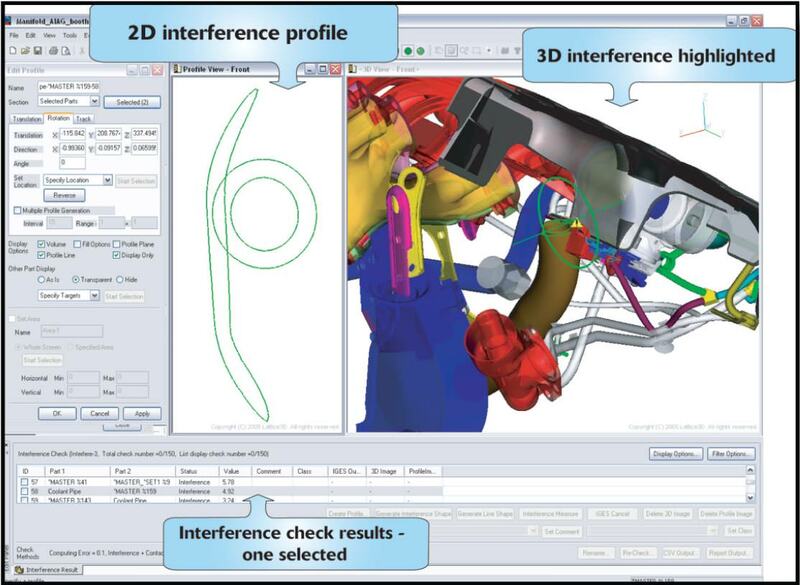 Static and Dynamic interference checking and clearance analysis including individual parts or whole assemblies. Output interference and clearance results to spreadsheets and other formats. Offset surfaces to modify existing geometry to increase or shrink parts. Sophisticated cross section control: Track cross section along any edge. Output cross sections as IGES or DXF. If you need more information please contact the developers of XVL Studio PRO (Lattice Technology, Inc.), or check out their product website.